What’s Your Mantra? Opens This Thursday! What’s Your Mantra? officially opens on Thursday, June 26th, as a part of the DownStreet Art 2014 kick-off celebration! 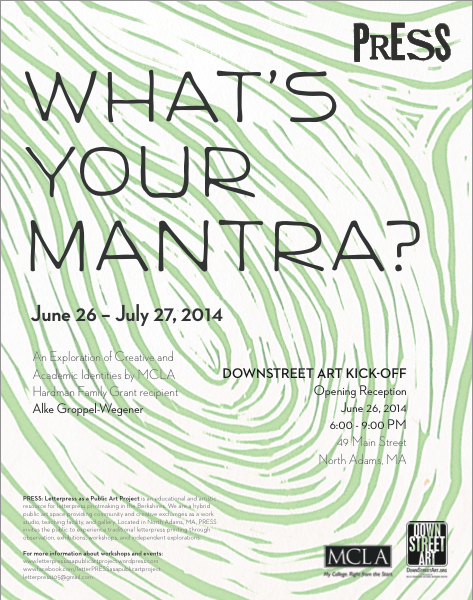 Join us from 6:00 – 9:00 PM to view Alke Groppel-Wegener’s prints, participate in your own mantra-making activity, watch us print the latest monthly mantra card, and enjoy light refreshments! PRESS visitors are participating in the exhibition by contributing their own mantras, which the artist will collect and compile into a book in the future. Do you have a mantra – something you’re always saying that keeps you going? My mom’s is “Make It Happen.” When I’m struggling to get through the day or an assignment, I remind myself to make it happen! I know I’ll be adding “Make It Happen” to the wall of mantras during the opening. Come by on Thursday night and let us know: What’s Your Mantra?